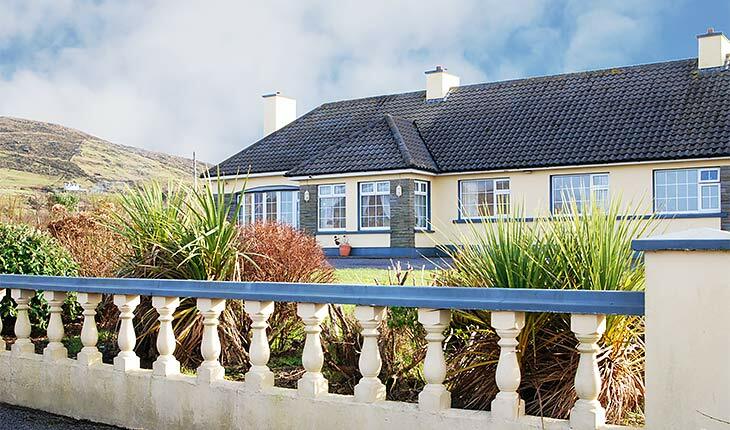 Very good location just 10 minutes driving from Portmagee and nice bedroom. Fantastic breakfast with many choices. Very kind and caring host, always ready to answer to your questions. If I go back to south-west Ireland, I'll book here again! It was just lovely. Maureen and Noel were generous and gracious hosts. Noel and Maureen were the delightful hosts. They have not left a detail undone. The rooms are clean and comfortable, nice views. Breakfast was delicious. In the evening they made themselves available for questions and listened to our stories and shared their own. I would so enjoy returning to visit. I will recommend this lovely spot to our friends. We would not have made it to Skellig Michael if not for their help. We had a lovely visit! Ocean View B&B was excellent. The Dohertys were very kind, and their B&B had very good rooms and a nice breakfast as well. The location was also very good; the "Ocean View" part of the name is literal. Furthermore, the proximity to Portmagee was very convenient for seeing Skellig Michael in the morning. I unreservedly recommend this B&B. Maureen and Nolan are very welcoming hosts and have a lovely establishment. Their recommendation for dinner was spot on! We had a lovely stay. Will come again if we ever have the chance. Maureen is running a very nice B&B and taking good care of her guest. She is offering a wonderful breakfast. Perfect location. Great hosts! Great location! Will definitely return! Lovely stay, Maureen and her husband looked after us very well, room was great, clean and big, surroundings beautiful, breakfast superb. Many thanks! We had such great appreciation for the proprietors. We had booked the wrong BnB! No sweat, they were very friendly and helpful at the last moment.. Very much appreciated. As we did not stay, we cannot honestly rate the accommodation and location and value. Maureen is a wonderful host! We had a very nice time and she went out of her way to make our stay enjoyable! Comfortable beds, delicious food, beautiful setting of Cahersiveen! Our room was very comfy and had everything we needed and the view was spectacular. Of course, the best was our hosts, who made us at home and answered all our questions, both before we arrived and once we were there. They were wonderfully friendly and welcoming. Without a doubt, when we return to the area we will happily stay at Ocean View B&B again. Lovely! Very nice people. Nice B&B. We spent one night at the Ocean Villa in July 2014 and it was a very pleasant stay. The room double was big enough and everything was very clean. Breakfast was great. But the best thing was the friendlyness of our hosts.The Dohertys are a nice couple and gave their best to make us feel at home. We would definitely chose the Ocean View B&B again on our next trip. An absolutely lovely place and probably the nicest B&B we stayed at this trip to Ireland and many were nice. The storage space in the room was incredible and the sink was outside the shower/toilet area big advantage for us. The view from the dining area was beautiful. Noel and Maureen were the most delightful people in the world!!! Warm and talkative and accommodating.... I could go on and on. We loved the Ocean View! And would we stay here again ABSOLUTLEY! My parents John and Mary stayed with you on Sunday night, they were blown away with your kindness and hospitality. they can not recommend your B&B highly enough, first class. thank you for giving them a nice time. Thank you Maureen and Noel for making our stay in Ireland so wonderful! Even though we arrived at night, exhausted from a long flight, both Maureen and Noel welcomed us with warmth and kindness! Their home is lovely and inviting, with beautifully decorated guest rooms. The peace and quite of the Inn, coupled with the amazing breakfast made our short stay memorable! Each morning our breakfast was made to order and each evening, despite the time we rolled in from sight seeing , there was warm tea and friendly smiles waiting up for us. Couple the amazing beauty of their surroundings with the BEST PRICE EVER FOR A ROOM, and you can see why this place is a "MUST SEE" when visiting Ireland. Thank you Maureen and Noel for making our summer trip to Ireland so wonderful! our stay was in every respect excellent,we are perfectly satisfied. My friends and I spent 8 nights at this wonderful B&B and thoroughly enjoyed everything about our experience. We were warmly welcomed by our hosts Maureen and Noel who made us feel right at home. The views from Ocean View are spectacular and the sunsets incredible. Breakfasts each morning were fabulous featuring Maureen's homemade Irish soda bread and other great goodies. Our hosts were very helpful as we planned our daily excursions. The rooms were bright and clean and very inviting. Would highly recommend Ocean View B&B and look forward to a return visit. I must say that my stay was remarkable. My room was wonderful it is clean a great place to stay. The view is just incredible as are the owners Noel and Maureen. The breakfast was delicious. They go out of their way to make you feel welcome It is like being at home. There are many brochures Noel and Maureen are eager to help answer any questions you may have. The price is right I will definitely return. I highly recommend Oceanview. Excellent experience-prompt response to inquiry, great location, comfortable environment, perfect place to relax. Scenery-- absolutely breathtaking! Grand reception by Maureen and Noel who provide excellent breakfasts and home baked goodies. Economically the best deal in Kerry. Will book again next year. This is one of the very best B&Bs in Kerry. Maureen and Noel are wonderfully gracious hosts providing top class service on every level with genuine warmth and care. This was our third time visiting Ireland and while we have always felt welcome everywhere we have stayed, Maureen and Noel took it to the next level. Even though we were late in finalizing our vacation plans, Maureen worked with us and was able to get everything squared away in short order. When we arrived, we were met with warm smiles and open arms. The accommodations were equally warm and comfortable. Located at the edge of town, it is the perfect place to take in the beautiful sunset and is easily within walking distance to the numerous pubs and restaurants. Our only complaint was that our visit was over too soon. We will be recommending Maureen and Noel to all our friends and will be counting the days until we can return. Well what can I say, an absolute pleasure. I stayed in the Ocean View in July. I was there for the Ring of Kerry cycle with some friends. We arrived on the Friday night and were welcomed with big smiles by the hosts Maureen & Noel, a most friendly and warm couple. They made us tea and showed us around the B&B. The building was in great condition and the rooms were welcoming and very well presented. The views from the B&B should not be underestimated, it looks out over amazing scenery and is a real pleasure to wake up to. We were so well looked after for the duration of our stay with great breakfasts and some snacks along the way too. We were exhausted having returned from our cycle but Maureen was on hand to replenish some energy while Noel very kindly took care of our bikes for us. Noel is a great man to ask for information on Kerry and is almost like an unofficial tour guide. He can tell you where to go, how to get there, what to look out for and give you the history of the whole place too. If you are coming to Cahersiveen, then you have to come stay in the Ocean View, it brings back that good old warm feeling that a B&B should give you. And its located in one of the most beautiful parts of the country. We spent one week at Ocean View B&B and enjoyed it very much. A very welcoming and friendly athmosphere. The hosts will help you with everything concerning restaurants or free time activities. The rooms were absolutely okay. We rented a car and with that we were able to get easily to a lot of attractions in the area. We recommend it and would go back any time! 8 nights I was a guest in the B & B. Despite unplanned arrival I was immediately taken absolutely friendly and even hosted on another evening. The entire next day I was like lifted in a small family. The food and the room or rooms, as well as a communal living room is available were great. The ocean view was fantastic. I can recommend this B & B absolutely. It is one of the best B&B I've stayed in. We were treated with home baked goodies by Maureen. They are very friendly and will assure you get a homely feeling at their place. Only B&B I've seen with full set of toiletries, on arrival refreshments and water bottles to take away. I'll give them full points and recommend others to use it as well. First rate B&B, if they were all like this no one would stay in hotels. Excellent hosts with a great knowledge of the area. Knowing they had a small baby staying with them, they went out and got a high chair in advance of our visit they already had a cot. Breakfast was great too. Awesome!!! If you are staying in Cahersiveen stay here. Excellent all round with special mention to the super helpful and friendly hosts, we even had home-made cake! Excellent, Felt like i was at home only i was been spoiled rotten. Excellent accomodations-clean,bright. Rooms-good size. Beds comfortable. Shower-lots of hot water. Location great for local sightseeing and trips to other towns on Ring of Kerry. Lots of parking for cars and place to secure bkies. Delicious Irish breakfast and welcoming tea and biscuits. Hosts-delightful,knowledgeable of area and Ireland in general. Perfect place to rest your head. Am planning another stay during the summer. One of the best B&Bs I've ever stayed in.